I am blessed to be married to a handyman. He seems to know how to fix most anything. I am constantly amazed by John's knowledge about how to do things. Like how did he know that thingy would fix the whatzit? And everything he does is perfection. Yes, John is a perfectionist. It's a blessing and a curse for an Electrical Engineer. It's a blessing because anything you do will be the best. The curse part comes in for the wife. Although I get benefits from the great things he does, I am also very aware of my imperfectionist ways. But something happened to show me that even my dear EE Perfect husband sometimes does not get it right. 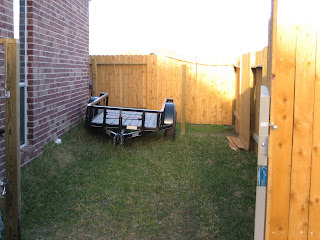 John wanted to build a fence on the side of our house so he could put the trailer behind it, freeing up room in our garage. He planned, he measured, he shopped, and finally he began his project. I had complete faith in him. In our last house he built a fabulous deck. So, I knew that a fence should be a piece of cake, right? First the posts when up. It was hard for John to wait for the cement to cure. 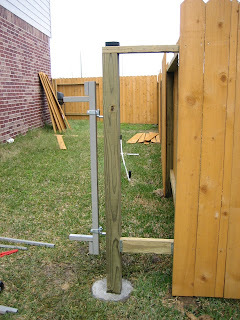 He knew what his fence was going to look like and he couldn't wait to finish this home improvment project. 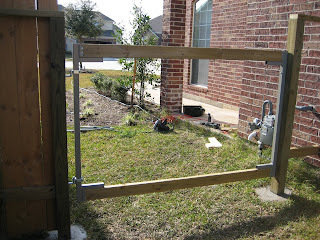 Then he put up the frame to the gate. I was witness to pulling the trailer in before he put the boards up on the gate. We had to pull the gate as far as we could get it and then with a lot of pulling and pushing he got the trailer in. John is a total measure three times, cut once type of guy. He measured three times. His mistake was that he only allowed one inch clearance for the trailer. And he still had to put up the boards. Which would take away more than that one sad remaining inch. I left him to his project as he put up the last of the boards. He came in very proud of his gate. I went out to view his beautiful fence. "Thank you most beautiful and lovely lady in the land." "How are you going to get the trailer out?" "Oh, I'll never be able to get it out. At least not without taking down the fence."